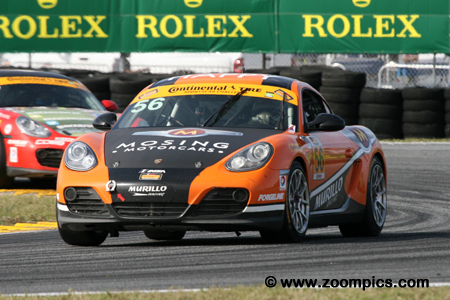 The 2017 edition of the Continental Tire SportsCar Challenge consisted of ten events (Daytona, Sebring, Circuit of the Americas, Watkins Glen, Canadian Tire Motorsport Park (CTMP), Lime Rock, Road America, Virginia International Raceway, Mazda Raceway Laguna Seca and Road Atlanta) for showroom stock cars. Most races were 2-hours in length. The cars were relatively unchanged from their road going versions – modifications were mandated primarily for safety – roll cages, window nets, etc. They were also required to use tires provided by series sponsor Continental. Grand Sport (GS): This category underwent some changes in 2017. The new rules accepted cars prepared to the SRO (Stephane Ratel Organisation) GT4 technical requirements while including vehicles that competed in the 2016 championship. The quicker of the two groups, this class includes cars such as the Ford Mustang GT4, Aston Martin Vantage, Nissan 370Z and Porsche Cayman GT4. Vehicles competing in this group produce between 400 - 500 horsepower and are capable of speeds over 175-mph. Street Tuner (ST): This class is for smaller sedans and sports cars with four or six-cylinder engines. Vehicles racing in this group include the BMW 328i, Porsche Cayman, Mazda MX-5, Nissan Altima, Audi S3 and MINI JCW. The cars in Street Tuner produce between 220 – 280-horsepower. 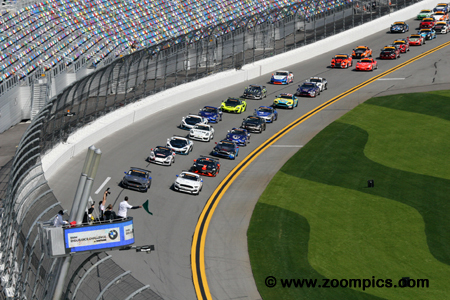 The opening round of the 2017 Continental Tire SportsCar Challenge took place at Daytona International Speedway as a support event for the Rolex 24. Thirty-eight entries would compete for four hours around the 12-turn, 3.56-mile track which utilized an infield road course and almost the entire tri-oval. Thirty-eight Continental SportsCar Challenge entries are given the green flag. Leading the field are nineteen of the quicker Grand Sport cars - this is a far cry from last year when only eight of the cars started the season’s first event. Trailing the Grand Sport group are the nineteen Street Tuner entries. Dean Martin driving a new Ford Mustang GT captured the pole-position. 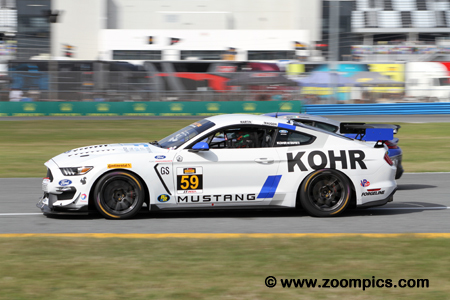 The KohR Motorsports Mustang was only delivered on the Tuesday before the event. The team spent the practice sessions chasing a vibration. Martin would share the driving with Cameron Maugeri. At the start, he slotted in behind Scott Maxwell and ran second until the car stopped on track. With repairs made the team salvaged a twenty-eighth place finish. 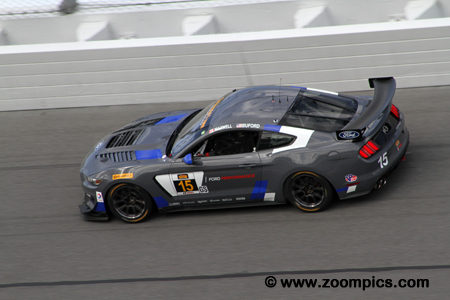 Making it an all Ford front row was the Multimatic Motorsports Ford Mustang GT driven by Scott Maxwell. Maxwell was just 0.034-seconds slower than the pole-sitter, Dean Martin. Sharing the Mustang with Maxwell was Jade Buford. The car was in contention when the team received a penalty for excessive speed in the pit lane. A second penalty was issued when Maxwell spun the wheels while the Mustang was on the jack. Despite these setbacks, they finished fifth. The fastest qualifier in the Street Tuner category was Connor Bloum in RS1 prepared Porsche Cayman - he set a time of 2:04.900. Sharing the No. 18 Porsche with Bloum were Aurora Straus and Nick Longhi. Bloum led the class until the first caution when the car dropped to seventeenth in class. The drivers spent the remainder of the race climbing back up the lap chart and finished fourth in Street Tuner. 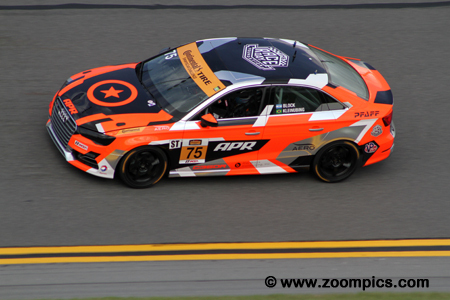 Just under half a second slower than the pole-winning Street Tuner Porsche was the Audi S3 entered by Compass 360 Racing. Pierre Kleinubing drove the first stint and would hand over the Audi to his co-driver Roy Block. The car fell out of contention during the first pit-stop and another extended visit to the pits left them thirty laps behind the class winners at the finish. At the checkered flag, they were classified in thirty-second position. The three MINI JCWs delivered a respectable qualifying performance – starting third, sixth and ninth on the Street Tuner grid. 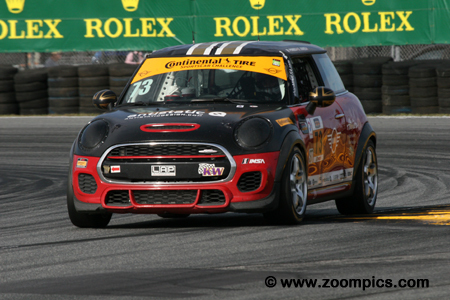 Despite their aerodynamic disadvantage at Daytona where straight-line speed is rewarded, the MINIs were contenders. The quickest of the three proved to be the No. 73 shared by Mat Pombo and Derek Jones which won the season opener by a narrow margin. The No. 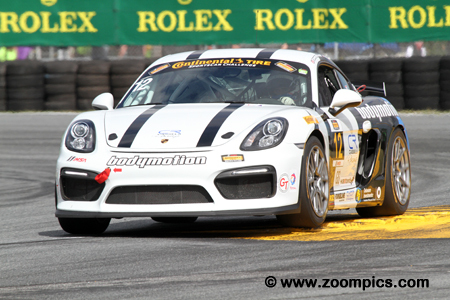 12 Bodymotion Racing Porsche Cayman GT4 started sixteenth in the nineteen Grand Sport field. Sharing the car were Trent Hindman and Cameron Cassels – Cassels performed the qualifying duties. Some great driving and an excellent race strategy allowed the pair to take the season’s first victory. This was all the more remarkable as it was the first time that Cassels competed at Daytona. Matt Plumb qualified the No. 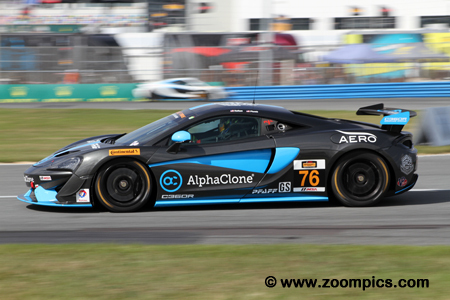 76 Compass 360 Racing prepared McLaren 570S GT4 third. The car Plumb shared with Paul Holton encountered problems on the pace lap. The team made repairs and after a number of pit stops - the pair finished thirty-first. The highest finishing McLaren was the Automatic Racing entry driven by Chris Hall and Alan Brynjolfsson which finished eighth in Grand Sport. Finishing second in Street Tuner, just 1.568-seconds behind the category winners was the No. 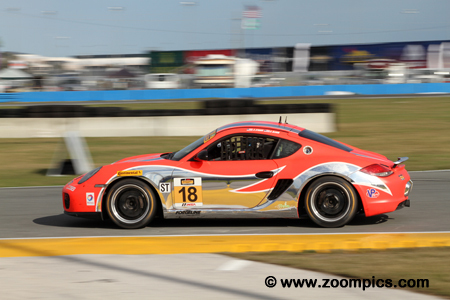 56 Porsche Cayman entered by Murillo Racing. Sharing the Cayman were Eric Foss and Jeff Mosing. Mosing was responsible for qualifying the car and put the Porsche in the twenty-third starting position which was fourth in the Street Tuner class. Quickest of the C.J. Wilson Porsche Cayman GT4 entries was the No. 33 qualified by Till Bechtolsheimer. After the final caution period, with approximately 30-minutes left in the event, the Porsche was in fourth. 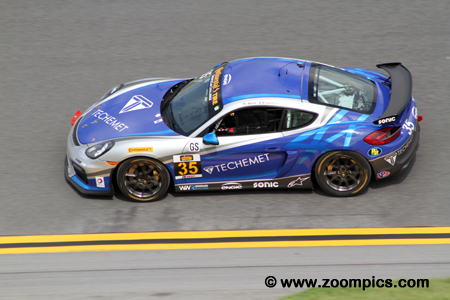 Bechtolsheimer’s co-driver Marc Miller was behind the wheel and moved up three positions before the checkered flag. He finished second - 0.577-seconds behind the winner. Finishing third overall and in the Grand Sport class was the second entry from C.J. Wilson Racing. Sharing the No. 35 Porsche Cayman GT4 were Russell Ward and Damien Faulkner. Ward qualified the Porsche thirteenth in class and overall. The team never fell below their starting position and were in second place when they were passed by the teammates. They would earn the final spot on the podium. 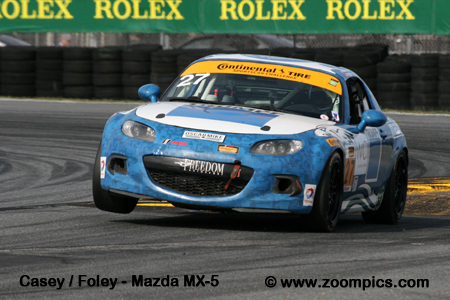 Defending Street Tuner Champions, Spencer Pumpelly and Nick Galante shared the No. 17 RS1 Porsche Cayman. 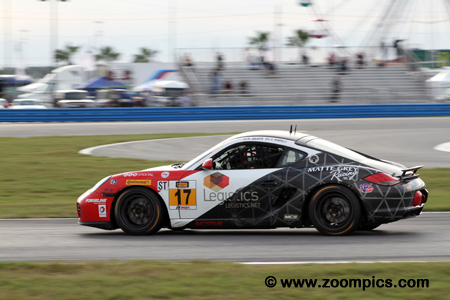 Galante was responsible for qualifying the Porsche and started seventh in Street Tuner and twenty-sixth overall. 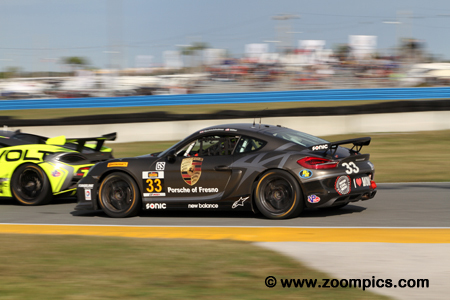 The car was as low as eighth in class, but Pumpelly who drove the final stint and moved the Porsche up the race order. They were third in Street Tuner at the checkered flag.